Modularity design: each module can be replaced separately; the unique dual adjustable angles make it easily to adjust the lighting area. Waterproof design: IP65, and resist Category 12 hurricanes. Widely used in main roads, high ways, viaducts, urban streets, overpasses, sidewalks, squares, schools,residential areas, industrial districts, parks and so on. Panel casting light makes the light on the road surface more evenly with small glare and large lighting area. Compact structure, beautiful appearance, black color integrated with tunnels, night sky and so on, get the effect of seeing the light without seeing the lamp. The silicone circle sealing technology and waterproof IP65 can completely prevent dusts and water in rainstorm. In professional wind test, with the highest wind speed 35m/s, that is to say in the category 12 hurricanes, there is no deformation or looseness, and it is extraordinarily firm. 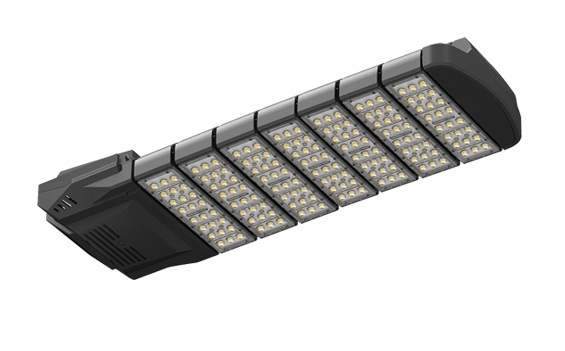 ASA cover and aluminum dissipating moduleL small in size, light weight and high intensity can effectively reduce lamp post’s pressure, lower the wind resistance, safe and reliable. Aluminum dissipating module has surface anodic oxidation process, getting a protective shield and greatly enhance the stain resistance. Its ASA cover is resistant to high heat, anti-aging and lasting brightness, therefore it is widely used outdoors. The unique dual adjustable angles: each module and lamp arm’s adjustable angle is ±6 °, greatly increases the lighting flexibility of complete lamps. The complete lamp consists of 2 to 7 modules, and choosing the number of modules according to the requirements. Each module can be replaced separately, easy to install and save costs. Aluminum heatsink base is zero-contacted with LED lighting source; the innovatively designed modularity fin group optimize the air channel, effectively enlarges the dissipating areas. Cooperated with air channel cover. It perfectly solves the thermal dissipating problem.